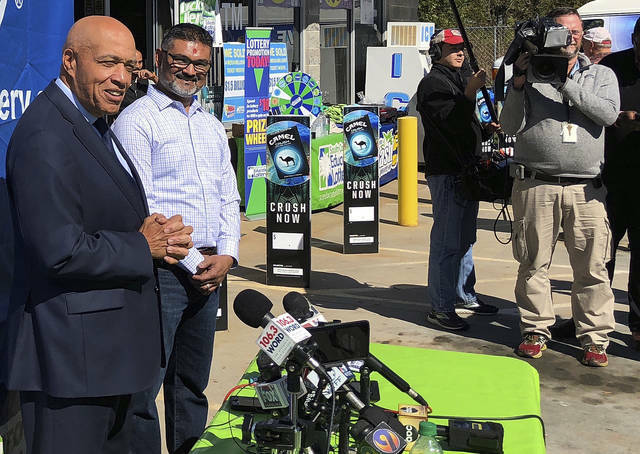 South Carolina Education Lottery Chief Operating Officer Tony Cooper, left, and KC Mart owner CJ Patel, right, speak to reporters Wednesday about the winning ticket sold at the Simpsonville, S.C., store. Patel will get $50,000 for selling the winning ticket. Unless the winner chooses to come forward, the world may never know who won. SIMPSONVILLE, S.C. — The number of billionaires in South Carolina may have doubled overnight — at least before taxes — after a lottery ticket sold in the state won the $1.537 billion Mega Millions lottery jackpot. The ticket, sold at the KC Mart in Simpsonville, matched all six numbers drawn Tuesday night, defying the 1 in 302.5 million odds to win the near-record prize. The winner would only become an actual billionaire by taking the prize in annual installments over three decades and hanging on to the bulk of the money. The lucky person can also take an $877.8 million lump-sum cash payment, which most winners choose to receive. South Carolina Education Lottery officials know when and where the winning ticket was bought, but until someone turns the ticket in, they won’t know who bought it. And the public may never find out. South Carolina allows lottery winners to remain anonymous after conducting a thorough investigation to confirm their identity, lottery Chief Operating Officer Tony Cooper said. The name of South Carolina’s last big winner — a $399 million Powerball jackpot in September 2013 which at the time was the fourth biggest lottery prize in U.S. history — has never been made public. “Our message to the $1.5 BILLION #Mega Millions jackpot winner: Sign the back of the ticket, place the ticket in a safe location, speak with a trusted advisor and CALL THE LOTTERY at 1-866-736-9819. Take a deep breath and enjoy the moment!” the South Carolina Education Lottery tweeted. The prize is extraordinary by any measure, but particularly so for South Carolina. With more than $1.5 billion, an exceedingly generous winner could shower roughly $307 on each of the state’s five million people. It’s about as much as 20 percent of the state’s $8 billion annual budget. “It’s a big, big win for South Carolina,” Cooper said. Lottery officials said the state will get $80 million in taxes. The state sold around $15 million worth of tickets just for Tuesday night’s drawing, with most of the revenue going to education, Cooper said. In 2016, Forbes listed only one billionaire in South Carolina, InterTech Group CEO Anita Zucker. She was worth $1.8 billion from the chemical, real estate and manufacturing conglomerate, the magazine reported. An earlier Mega Millions estimate of $1.6 billion would have been a world record for lotteries, but actual sales came in below the $1.586 billion Powerball jackpot prize shared by winners in California, Florida and Tennessee in January of 2016. “Estimates are based on historical patterns,” said Carol Gentry, a spokeswoman for the Maryland Lottery, which leads a consortium of state lotteries participating in the Mega Millions jackpot in a Wednesday morning phone interview with The Associated Press. “The jackpot’s been rolling since it was hit in July in California, but there are few precedents for a jackpot of this size,” Gentry said. South Carolina is one of eight states — along with Delaware, Georgia, Kansas, Maryland, North Dakota, Ohio and Texas — where winners can remain anonymous. The winner also has up to 180 days to claim the prize. KC Mart owner CJ Patel will also be a winner. He gets a $50,000 bonus, and said Wednesday he will share part of it with his employees. He has owned the store not far from where Greenville’s suburbs turn rural for more than three years. Patel said lottery ticket sales were brisk leading up to Tuesday and he has no idea who bought the winner. The Mega Millions jackpot grew so large because no player had won the top prize since July 24, when 11 co-workers from California won a $543 million prize. Although Tuesday’s jackpot was gigantic, it’s no fluke. It reflects a trend toward ever-growing lottery prizes due to changes that worsened the odds with hopes of bigger jackpots and better sales. Powerball officials made the first such move in October 2015, changing the odds of winning the jackpot from 1 in 175 million to 1 in 292.2 million. Mega Millions followed suit in October 2017, with odds worsening from 1 in 259 million to 1 in 302.5 million. While most attention has focused on Mega Millions, Powerball also has been soaring. The estimated prize for Powerball’s annuity option in Wednesday night’s drawing is $620 million, with a cash prize of $354.3 million. Some KC Mart customers were hoping Wednesday that some Mega Millions luck would rub off as they played Powerball. “Sell me another lucky one. Now I know y’all have it!” Chase Hatcher said, trading smiles across the counter with Jee and Twinkle Patel.